Wladimir Klitschko of Ukraine celebrates after his WBO Heavyweight World Championship fight against American Eddie Chambers Saturday in Duesseldorf, Germany. (CNN) -- World heavyweight champion Wladimir Klitschko knocked out U.S. challenger Eddie Chambers with five seconds remaining in the 12th and final round to defend his IBF, WBO and IBO titles. The Saturday bout in Duesseldorf, Germany, was the 33-year-old Ukrainian's fifth defense of his WBO and IBF titles. Chambers went down for at least two minutes after receiving Klitschko's left hook to the right temple, according to CNNSI's Bryan Armen Graham round-by-round blog of the fight. Read Graham's account of the fight. Early in the fight Chambers -- at 209 pounds (94.8 kg), 36 pounds (16.3 kg) lighter than Klitschko's 245 (111.1 kg)-- lifted his opponent into the air twice, dumping him onto the canvas. 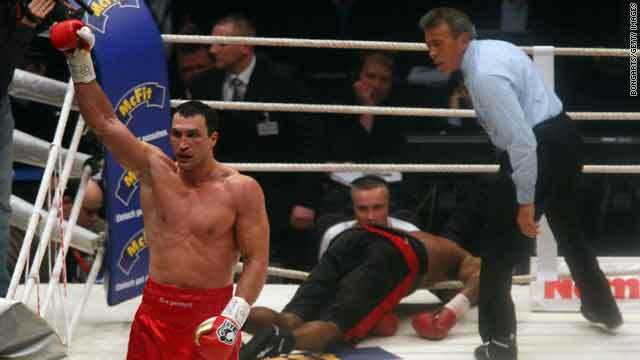 Chambers had managed to outmaneuver Klitschko's punches until the end despite being outmatched. Chambers won some extra recovery time after getting his broken right glove replaced in the 10th round. The 8-to-1 favorite Klitschko's win is his 12th straight successful title defense. He has hasn't lost a fight in nearly six years. His brother Vitali is the WBC heavyweight champion. CNNSI's Bryan Armen Graham contributed to this report.